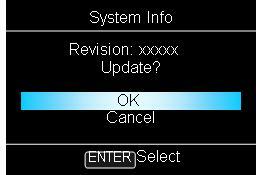 The instruction describes how to update the system software for DVDirect model VRD-MC6. Note: For updating the system software on the "VRD-MC6", user need to create a system software updater CD using the computer. Please prepare one blank CD-R disc for creating the update CD in advance. Download the system software update zipped folder VRDMC6Updater.zip and unzip it. Please note where you have downloaded the folder. Within the folder, there is a file, SNDH8U66.DA3, which you will need to create a system software update CD. Create the system software update disc by copying file SNDH8U66.DA3 to a CD disc. Below is how you can copy file SNDH8U66.DA3 to a CD by using Windows XP. However, if you have any other CD burning software, it can be used as well. The important thing is to copy the file SNDH8U66.DA3 onto a CD disc. Insert a blank disc into the computer's CD drive. Open My Computer, browse for the system software update file that you downloaded, and click Copy this file in the File and Folder Tasks pane. In the "Copy Items" dialog box that appears, click the CD drive where you inserted the blank disc, and then click Copy. Click the balloon message that appears in the notification area. Click Write these files to CD in the CD Writing Tasks pane. Follow the instructions of the CD creation wizard, and finish writing to the CD. Press POWER button to power on VRD-MC6. Insert the System Software Update CD into VRD-MC6. VRD-MC6 will load the disc and will appear the following message, "Unusable disc inserted. Insert a compatible disc." Please disregard this message and select Return from the control buttons. VRD-MC6 will ask for your update confirmation again. To continue, select OK. The updating process will take approximately 15 minutes. During this time, it is imperative that the system is not powered off. After the update, VRD-MC6 will turn restart automatically. Press the Eject button to remove the System Software Update CD. Power off the unit. To confirm the update, power on VRD-MC6 and repeat step 4 to confirm. The new System Updated Version should be 66R3. Windows is a registered trademark of Microsoft Corporation in the United States and/or other countries.